1991 is the year Agassi made his comeback at Wimbledon after a 3 year boycott, the year another German (Michael Stich) won the Championships, but it’s also the year of the first Middle Sunday in Wimbledon history. Rudyard Kipling‘s words are boldly displayed in the All England Clubhouse, there to inspire players as they wend their way from the dressing rooms down to Centre Court. As I stood staring up at them in 1991, during the wettest Wimbledon in history, they has a striking resonance. 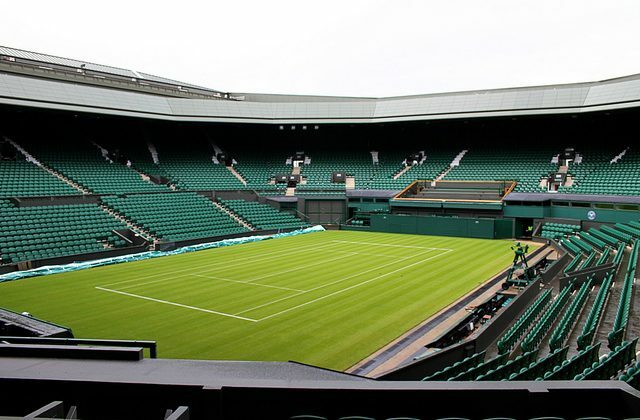 The weather conditions had just forced us into scheduling an extra day’s play for the Middle Sunday of The Championships – but right now we had no tickets, no security, no catering, no umpires, no groundstaff, and no precedent to follow. Whether triumph of disaster lay ahead – who knew? On Friday evening the decision was made to play on Middle Sunday for first time in Wimbledon history. I am not sure whether he was a shrewd operator or a genuine enthusiast, but his comments certainly endeared him to the crowd, and guaranteed cheering fans wherever he went. “Sunday dawned bright and sunny. I know, because I saw it. The forecast had been right, and we were set for a full day’s play, which was the first bit of good news. We opened the gates at 10, but had decided we could not start play until midday, because of the time it would make 25000 people to get through the turnstiles. I positioned myself strategically to watch the first of the crowds coming through the turnstiles . The first people in took 56 seconds to get to their seats – just above the scoreboard, incidentally, where they were likely be seen on TV. People queuing outside were in high spirits, cheering the golfers on the course opposite as they filed past, and their festive mood continued throughout the day. On Centre Court especially, the atmosphere was incredible. All the seats were full by 12 when play started, and I have never heard so much noise, so much singing. Even the Royal Box had a different feel to it, with past champions having been invited in place of the usual dignitaries. Mexican waves were rolling around the seats, and the crowds, enjoying the role of unseasonal pantomime audience, treated the players and ball girls and boys to a rapturous reception. Meanwhile the ‘villains’, the linespeople and umpire, were booed. It appeared to be a different crowd from the normal. It was great fun. I couldn’t stop laughing. It turned out to be one of the most enjoyable and successful days in the history of The Championships. It was splendid in every way. Follow our Wimbledon coverage on Tennis Buzz.